Friends of the Library sponsors the Books for Babies Program at Knox Community Hospital. Each family of a newborn receives a public library card reminder, free FOL family membership, information pamphlet, and colorful first children's book to promote the importance of reading. Every year the Public Library of Mount Vernon and Knox County host the In the Know Team Challenge, sponsored by the Friends of the Library. Three teams will challenge the Mount Vernon High School In the Know team. Cheer on the teens, the FOL team, the community team, or the library team during this tough academic trivia challenge. The Friends of the Library host the annual Christmas Walk at the Public Library of Mount Vernon and Knox County. Start the holiday season off with the Christmas event of the year. Enjoy live entertainment and refreshments provided by the Friends of the Library. Come in, enjoy the festivities and sign up for a free door prize also provided by the Friends of the Library! 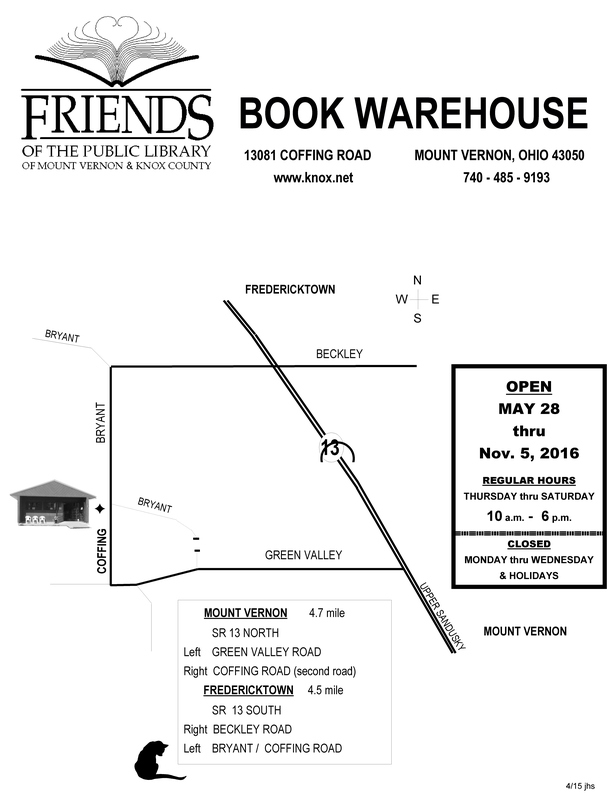 All proceeds benefit programs at the Mount Vernon, Fredericktown, Danville and Gambier locations of the Public Library of Mount Vernon & Knox County. The book warehouse only accepts Cash or Check. Sorry, no debit or credit cards can be accepted.